The WindowedOperator is an operator in the Apex Malhar Library that supports the windowing semantics outlined by Apache Beam, including the notions of watermarks, triggers, accumulation modes, and allowed lateness. It currently supports event time windows, sliding event time windows, session windows, and global window. The reader of this document is encouraged to read this blog for the basic concepts of streaming applications, and this blog for Apache Beam's windowing semantics before using this operator. 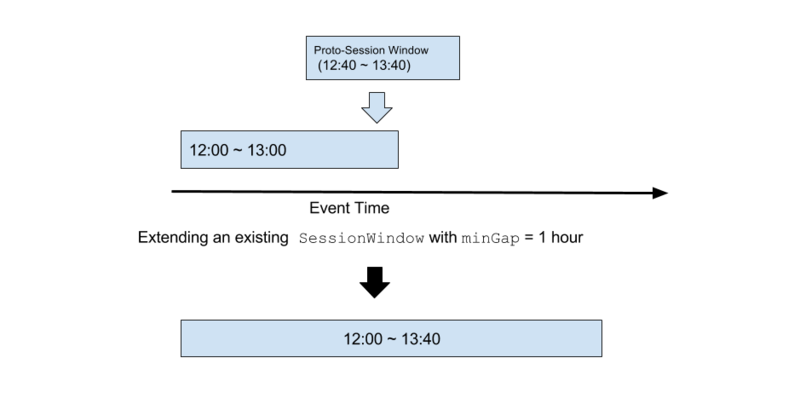 Our High-Level API supports event-time processing through the WindowedOperator. If you'd like to process tuples based on event time, you are encouraged to use this operator either directly with our DAG-level API, or indirectly through our High-Level API. It is important to note that the word "windows" in this document is unrelated to "streaming windows" or "application windows" in Apex, which are based on ingression time. For more information about "streaming windows" and "application windows" in Apex, please refer to this document. In this document, we will explore the following features in the WindowedOperator. One of the first things the user of the operator has to decide is whether the operator is keyed (KeyedWindowedOperatorImpl) or not keyed (WindowedOperatorImpl). State storage, accumulation and triggers behave differently based on whether or not the operator is keyed. Here are examples of creating a windowed operator. We will cover the concepts of state storage, accumulation and triggers later in this document. Each incoming tuple of the WindowedOperator is assigned to one or more windows. The WindowOption provides the way to specify what constitutes a window. The following WindowOptions are supported. There is only one window for the entire duration of the application. All tuples are assigned to this one window. A tuple is assigned to exactly one window based on event time, and each window has a fixed duration. One window is followed immediately by another window, and they do not overlap. As a result, one timestamp can only belong to one window. Similar to TimeWindow, each window has a fixed duration. But it takes an additional duration parameter slideBy which must be smaller than the window duration and the window duration must be divisible by the slideBy duration. Each window overlaps with multiple windows. In this case, since one timestamp belongs to multiple windows, a tuple is assigned to multiple windows. The number of windows a tuple belongs to is exactly the window duration divided by the slideBy duration. SessionWindows have variable durations and are based on the key of the tuple. Each tuple is assigned to exactly one window. It takes a duration parameter minGap, which specifies the minimum time gap between two tuples that belong to two different SessionWindows of the same key. minGap is also the duration of the "proto-session" window for a single timestamp, and it is the minimum duration of any session window. Upon arrival of a tuple, a proto-session window is created. 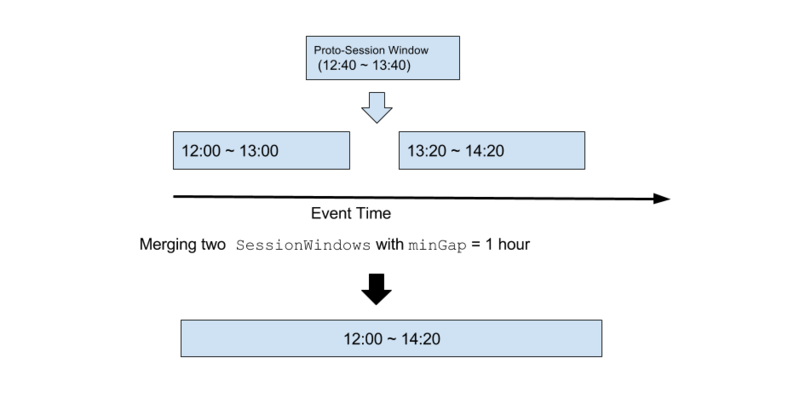 A proto-session window for a tuple is a temporary session window with begin timestamp being the tuple timestamp and the duration being minGap. The new tuple is simply applied to the state of the existing SessionWindow. A new SessionWindow is created with the state of the existing SessionWindow, plus the new tuple, with a longer duration than the existing SessionWindow and possibly an earlier begin timestamp to cover the new tuple. The existing SessionWindow will be deleted and a retraction trigger for the old window will be fired. The proto-session window is in effect and the new tuple is assigned to that window. The WindowedOperator expects a timestamp extractor. This is for WindowedOperator to extract the timestamp from the tuple for window assignment. Watermarks are control tuples that include a timestamp. A watermark tells WindowedOperator that all windows that lie completely before the given timestamp are considered late, and the rest of the windows are considered early. If watermarks are not available from upstream, the user of the WindowedOperator can set a fixed watermark. The fixed watermark represents the number of milliseconds before the timestamp derived from the Apex streaming window ID. Note that the Apex streaming window ID is an implicit timestamp that more or less represents the ingression time of the tuple. Allowed Lateness specifies the lateness horizon from the watermark. If a tuple has a timestamp that lies beyond the lateness horizon, it is dropped by the WindowedOperator. Also, if a window completely lies beyond the lateness horizon as a result of the arrival of a new watermark, the window along with its state is purged from WindowedOperator. The Accumulation object tells the WindowedOperator how the operator state is accumulated. It tells the WindowedOperator what to do with its state upon arrival of an incoming tuple. This is where the business logic goes. Please refer to the interface definition here in github. For non-keyed WindowedOperator, the state is per window. For keyed WindowedOperator, the state is per key per window. The user of this operator can use one of the existing accumulation implementations here, or provides their own custom accumulation that reflects their business logic. Triggers are tuples emitted to downstream by the WindowedOperator. The data in the tuples are based on the state of WindowedOperator governed by the Accumulation object. There are two types of trigger: time-based triggers and count-based triggers. Time-based triggers are triggers that get fired in a regular time interval, and count-based triggers are triggers that get fired based on the number of tuples received. The user of WindowedOperator can specify different triggers for windows that are early or late based on the watermark. Also, by default, a trigger is fired for a window when the window is flipped from being early to being late. This is also called an "on-time" trigger. Note that for the non-keyed WindowedOperator, triggers are fired on a per-window basis. For the keyed WindowedOperator, triggers are fired on a per-key-per-window basis. There is also an option the user can set (fireOnlyUpdatedPanes) to make the WindowedOperator not fire a trigger if the trigger value is the same as the value of the previous trigger. Accumulation Mode tells the operator what to do with the state of the window when a trigger is fired. There are three supported accumulation mode: ACCUMULATING, DISCARDING, and ACCUMULATING_AND_DISCARDING. ACCUMULATING_AND_RETRACTING: The state of the window is preserved until purged, but if the state has changed upon a trigger compared to the previous trigger, an additional retraction trigger is fired. It is possible to chain multiple instances of WindowedOperator and have only the most upstream instance assign the windows and have all downstream instances inherit the same windows of the triggers from the upstream instance. If WindowOption is null (i.e. setWindowOption is not called), the WindowedOperator assumes that the incoming tuples are WindowedTuples that contain the information of the window assignment for each tuple. One of the most important elements of the WindowedOperator is the state storage. Each window in the operator (or each window/key pair if the operator is keyed) has its own state and how the state is stored and checkpointed is likely to be the most important factor for performance. The WindowedOperator currently supports two different state storage mechanisms. In-Memory Windowed Storage stores the operator state only in memory and the entire state is copied to DFS at checkpoint. This storage is useful only if the state is expected to be small and the cardinality of valid windows and keys is small. Spillable Windowed Storage stores the operator state in DFS with a cache in memory. This storage mechanism handles large states and incremental checkpointing. The WindowedMergeOperator is a WindowedOperator that takes two incoming data streams. It takes a MergeAccumulation instead of a regular Accumulation. The user of this operator can implement their custom merge or join accumulation based on their business logic. Examples of this type of accumulation are InnerJoin and Cogroup. The WindowedMergeOperator has its own watermark. Its watermark timestamp is the earlier watermark timestamp between the two input streams. When that value changes upon the arrival of incoming watermarks, a watermark control tuple with that timestamp value will be fired to downstream. For an example usage of the WindowedOperator via the High level API, click here. For an example usage of the WindowedOperator via the DAG level API, click here. For the WindowedOperator to be idempotent, both data tuples and watermarks must be emitted deterministically. i.e. When replaying from a checkpoint, the same tuples and watermarks must be emitted in the same Apex streaming window as before the failure happens. The time-based triggers are fired based on the implicit timestamp from the Apex streaming windows, not based on the wall clock time. And the time-based triggers are fired only at the Apex streaming window boundary. This means that the Apex streaming window width should be smaller than or equal to the interval duration of any time-based trigger, and ideally the interval duration of the time-based trigger can be expressed as an integer multiple of the Apex streaming window width. The processing of the incoming watermarks is only done at the Apex streaming window boundary. This includes the change of status from early to late for windows that lie beyond the watermark timestamp, the purging of windows from the state for windows that lie completely beyond the lateness horizon, and the propagation of watermark tuples to downstream.